Sunday morning we hosted brunch for a group of friends, all of whom work (or used to work) in the aviation industry. Needless to say, the topic of conversation frequently turned back to shared work experiences. Despite this, we still had time to enjoy a relaxed meal of salad, sandwiches, and dessert. A ripe, juicy watermelon from a roadside stall in Korat province provided the inspiration for a cool, refreshing summer salad. 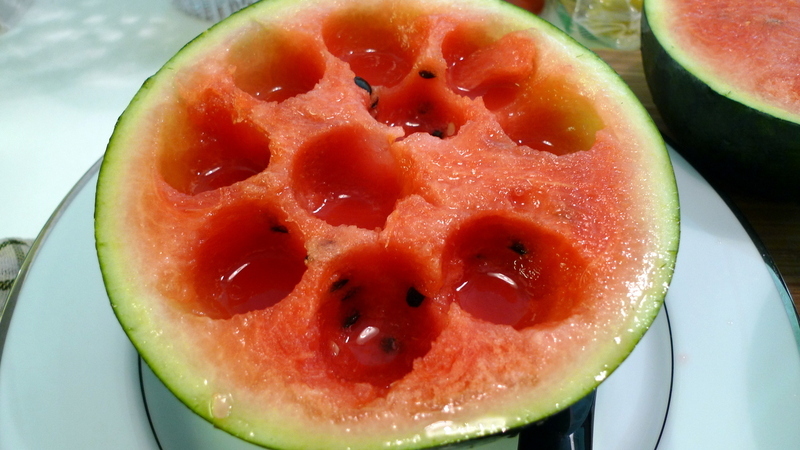 Trying to scoop melon balls while avoiding seeds was a challenge, though! 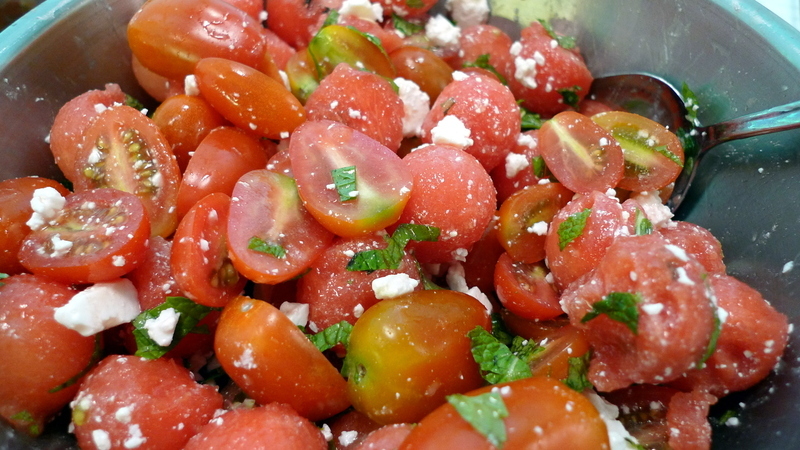 Based loosely on a recipe by the New York Times’ Mark Bittman, this salad features just four ingredients: watermelon, cherry tomatoes, feta cheese, and fresh mint. I didn’t dress the salad with a red wine vinaigrette as Mr. Bittman suggests, because when I tasted the combination I found the flavors already beautifully balanced. 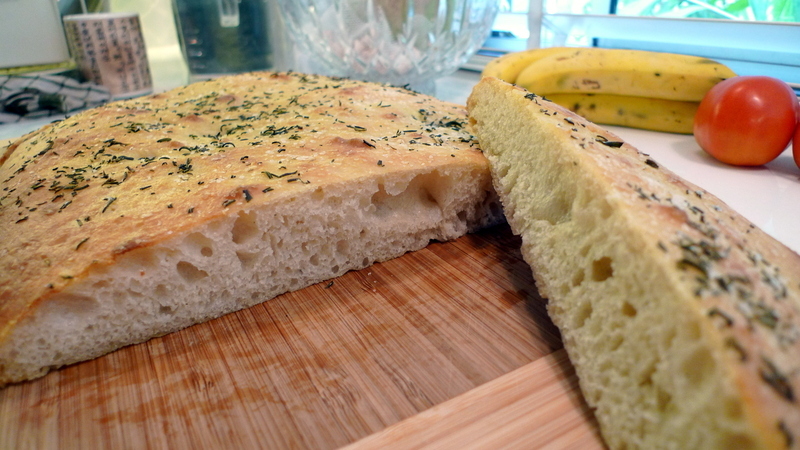 To make the main course, I first baked a batch of focaccia bread, the light, airy, rosemary infused Italian style bread. This batch was based on a recipe in the Los Angeles Times by La Brea Bakery owner Nancy Silverton. The problem is, the recipe is missing the last step: how long to cook the bread and at what temperature! Critical information, methinks. Referencing another recipe, 450 F for 15-20 minutes was sufficient. Despite the absence of time and temperature information, the loaf turned out nicely and when paired with some herb smoked ham from Soulfood Mahanakorn, provolone cheese, and a roasted red bell pepper and onion relish I made, we had some beautiful paninis. 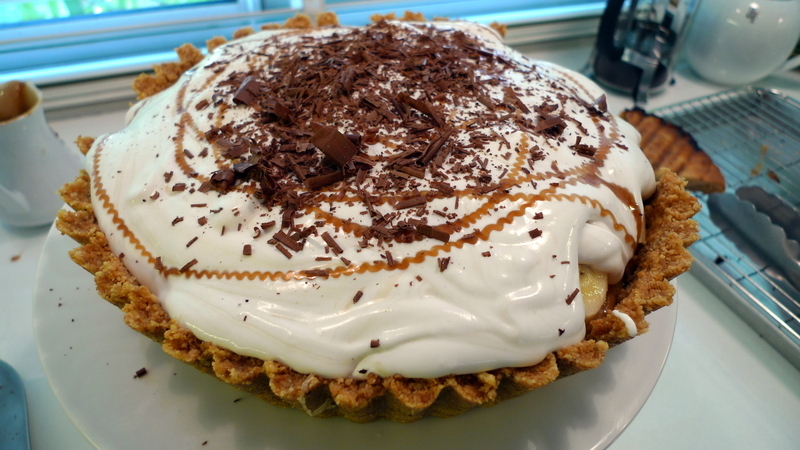 For dessert, I made one of Tawn’s favorites: banoffee pie. This British import features a layer of rich toffee on a cookie crumb crust, covered with freshly sliced bananas, whipped cream, a drizzle of coffee flavored syrup, and chocolate shavings. Instead of making a cheat version of the toffee, I made it the old fashioned way: boiling tins of sweetened condensed milk in a water bath for three hours until the contents caramelize. 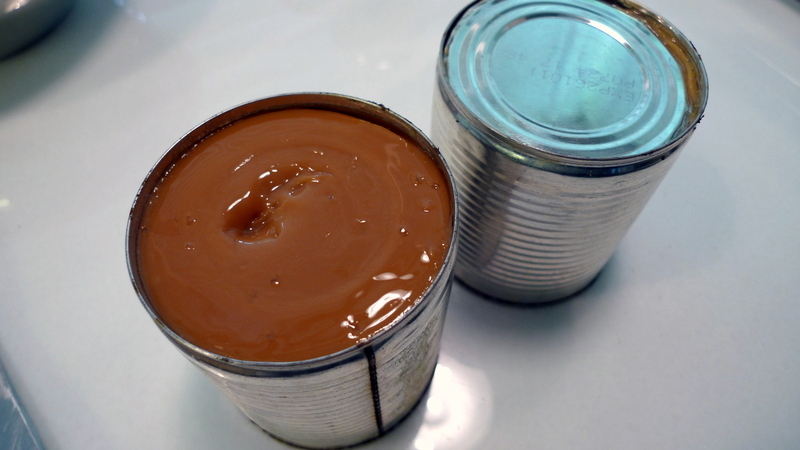 Care must be taken to keep the tins fully submerged, otherwise they will explode and spray your kitchen with boiling hot caramel. The end result – my first ever attempt at this dish – had its ups and downs. The crust hadn’t been made with enough butter so it didn’t hold up well, collapsing under the weight of the filling. The toffee, which was insanely tasty, was too much – one can would have been plenty. I didn’t whip the cream quite enough so it didn’t hold its shape and instead spilled through the collapsing crust. But, despite all that, it was really tasty. I’ll try again one of these days and refine the recipe. This entry was posted in Uncategorized and tagged baking, Banoffee, cooking, Focaccia, food, Panini, Pie, Salad, Toffee, tomato, Watermelon by christao408. Bookmark the permalink. It sounds absolutely sinfully delicious, Chris — looks pretty good too, although I do understand about collapsing whipped cream! I have this fantasy about visiting BKK and treating you guys out to dinner. In keeping with my anonymity, I’ll be wearing a mask. Omgoodness that looks so good!!! Chris… I’d pay ya to feed me, lol. You make *beautiful* and delicious looking / sounding food. such a refreshing salad for a lazy Sunday! yum, looks great! i guess the whipped cream wasn’t whipped enough… and i can’t imagine trying to boil condensed milk to caramelize it! but i can imagine that 2 cans would be a bit overbearing in terms of sweetness. maybe you should fold some whipped cream into the toffee layer to lighten it (which would help the crust by reducing some of the weight while keeping the volume)? Hey I may move to Thailand one of these days. What do you do for a living over there??? YAYAYAY – excellent – I have made all except the dessert. I agree with Aaron. Give it another chance. Mouth-watering! I love the look of the pie – and I love the toffee. My sister taught me how to make the caramel and boy was it good! The salad looks so inviting, despite the onslaught of snow here. 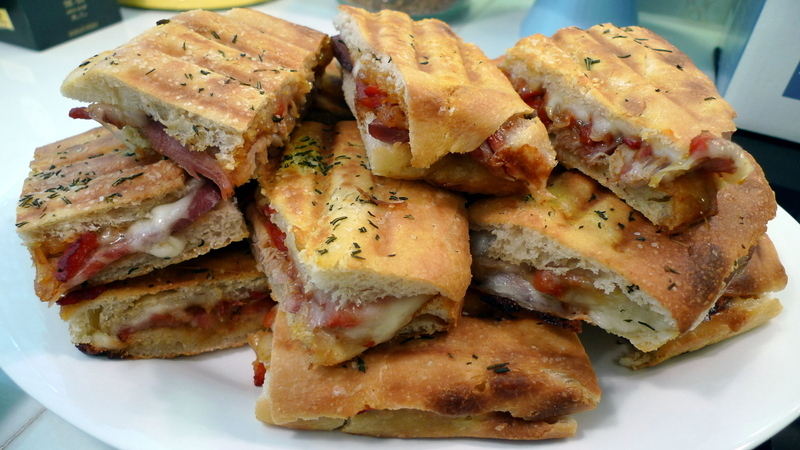 The panini and the dessert are yummy in the photos and in the taste center of my brain. That salad looks soooo inviting. I love everything you made! looks so yummie! i’m dreaming of the day you’ll feed me. seriously! @ElusiveWords – Few things would make me happier, Matt. Yearning to know Thailand. Longing to taste banoffee pie. Does that mean I’m still alive?